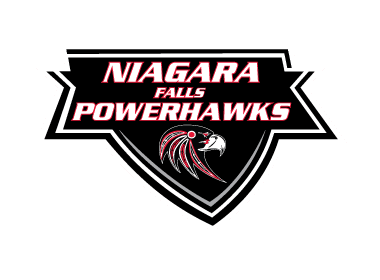 The Niagara Falls PowerHawks returned to action in the third weekend of the NA3HL hockey season with their third straight game against the perennial powerhouse, Binghamton Junior Senators. The PowerHawks were downed 11-4 Friday night at Ice House Sports Complex. Will Darling got onto the scoresheet early for the Junior Senators with an unassisted goal at 2:01 of the first period. Riley Botting pushed Binghamton to a 2-0 lead at 3:57, with Caden Dearborn assisting. Mason Fay continued the dominance of the first period at 11:18. Dearborn was credited with the assist. Mike Padgeon gave Binghamton a four-goal lead at 16:53. Eric Melso provided the assist. Greg Simmons closed out the first period for Binghamton with the team’s fifth goal with 55 seconds left in the period. Rory Gresham assisted on the power play goal. Binghamton continued with their scoring touch in the second period when Liam Murphy struck, unassisted, at 3:34. Niagara Falls then got on the board with two goals by Tristan Mock. The first came at 7:34, and the second at 10:43. Devin Johnson provided the only assists on both goals. Eric Melso answered back for Binghamton at 11:39. Nico Corsaro assisted. Miguel Mercado scored for Niagara Falls on the power play at 14:35 to draw the score to 7-3. Caden Dearborn found the back of the net for Binghamton at 17:10, unassisted, to finish the scoring for the second period. The third period started off like the other two periods with an early goal by Binghamton. Marcus Cook added his name to the scoresheet at 4:20. Simmons was credited with the assist. Rory Gresham was next to light the lamp for the Junior Senators. Aleksander Conrad assisted. Cam Orzechowski gave Niagara Falls its fourth goal of the contest, assisted by Jake Pembleton. Nico Corsaro closed out the scoring for the game, giving Binghamton its 11-4 victory. Padgeon was the lone assist on the play. Casey Boone picked up the win in goal for the Junior Senators before being relieved in the third period by Jeff Zero. Boone stopped 15 of 18 shots, and Zero was 19 of 20 in the third period. Noah Spiesz turned away 60 of 71 shots in the net for the PowerHawks. The same teams will see each other Saturday evening at the Ice House Sports Complex in Binghamton. Face off is set for 6:45pm.